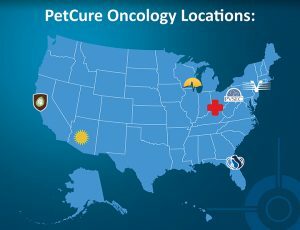 Chicago, IL – May 2, 2017 – PetCure Oncology’s industry-leading national network of veterinary cancer care centers will continue to expand this summer with the addition of new sites in San Jose, California, and Jacksonville, Florida, the company announced on Tuesday. The partnerships with SAGE Centers for Veterinary Specialty and Emergency Care (SAGE) in San Jose and Southeast Veterinary Oncology and Internal Medicine (SEVO-Med) in Jacksonville will increase PetCure Oncology’s national network to seven locations and extend accessibility to stereotactic radiosurgery (SRS) to pet owners from coast to coast. Since launching its first location in May of 2015, the veterinary cancer care provider has treated nearly 800 patients in less than two years. That includes more than 500 pet patients that have been treated with SRS, an advanced form of radiation therapy that used to be available only to human cancer patients. Already a proven standard of care in human oncology, SRS is quickly emerging as a go-to option in the treatment of pet cancer due to its noninvasive nature and sub-millimeter precision. Combined with innovative treatment planning software, the unprecedented accuracy enables delivery of high-dose radiation to a tumor while largely sparing the surrounding healthy anatomy. The end result is the ability to treat many tumors previously considered “untreatable,” and to do so with fewer treatment sessions and a significant reduction in patient risk and side effects. PetCure Oncology at SAGE and PetCure Oncology at SEVO-Med are both scheduled to open late this summer. They will first undergo minor renovations to their existing radiation oncology units in order to accomodate new linear accelerators capable of delivering SRS with RapidArc® technology and on-board imaging – hallmarks of the advanced technology found in PetCure-run facilities across the country. Specializing in radiation oncology for pets, PetCure Oncology partners with leading specialty animal hospitals around the country to collaboratively offer comprehensive cancer care. The new sites in San Jose and Jacksonville will join established centers in Pittsburgh (PA), Phoenix (AZ), Clifton (NJ), Milwaukee (WI) and Cincinnati (OH) in providing human-caliber cancer care to pets. To learn more about PetCure Oncology or SRS, visit PetCureOncology.com or call (773) 850-3400. PetCure Oncology is also currently accepting patients for a subsidized clinical trial for dogs with lung tumors. Visit PetCureOncology.com/ClinicalTrials for details.